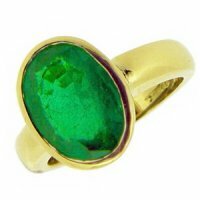 A simple yet enchanting ring set with an oval emerald in a fine rubover setting to a plain 3mm shank. The emerald measures (11.7x8.7mm) and weighs 3.22cts. All mounted in 18ct Yellow Gold. Hallmarked. A Handmade Emerald Ring London. 18k - 750.